One of the things besides the body design that appealed to me was the wheel tubs. Unfortunately they are slightly undersized to the body wheel opening. Also I checked the wheel tub assembly with both of my go-to FED chassis, the 147" wheelbase Ramchargers dragster and the Ivo/Too Much 200"+ wheelbase digger. 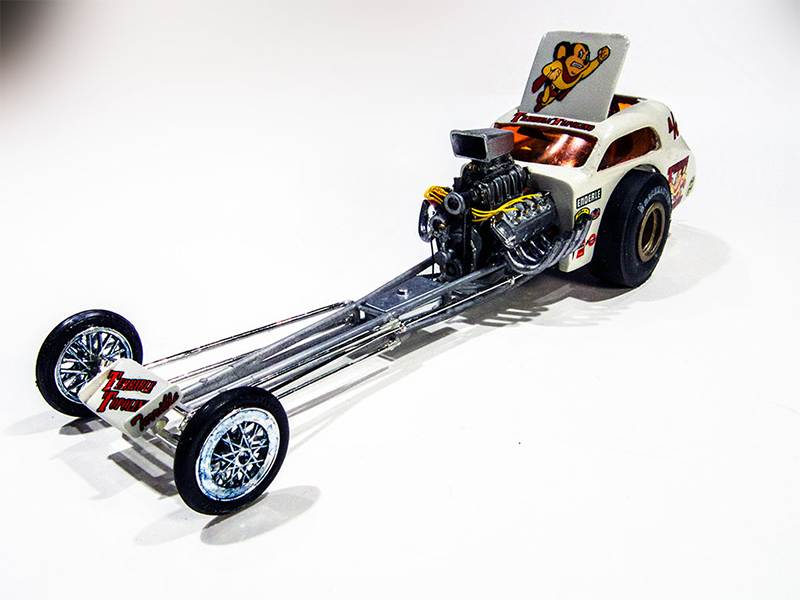 The Ramchargers chassis is my favorite - I prefer the moderately long wheelbase and the radically low legs-under stance. 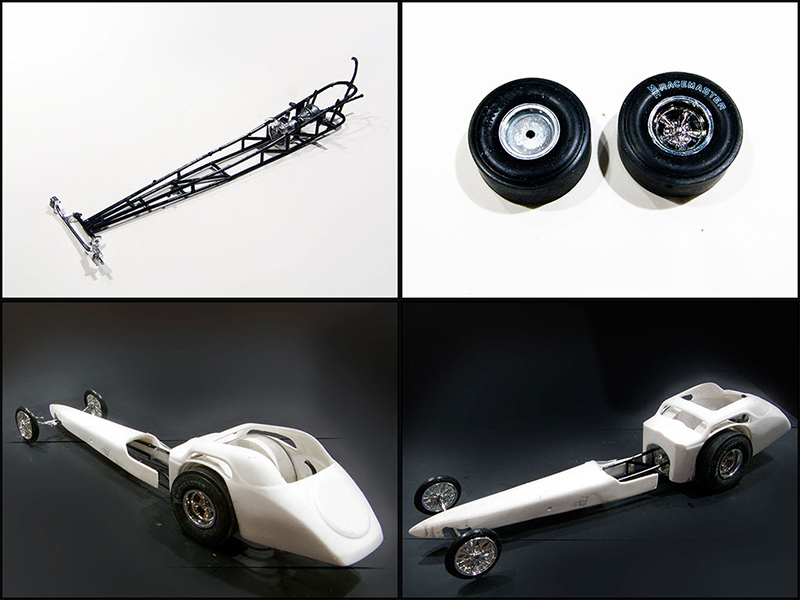 The Ivo chassis is a little long and lacks the near-perfect proportions of a circa 1964 Fuel FED. Unfortunately the space between the wheel tubs is acrtually too narrow for either chassis. So the wheel tubs will have to be cut apart and the tub sections molded to the coupe body. Also, I plan to fill in a portion of the open top and rear window area. 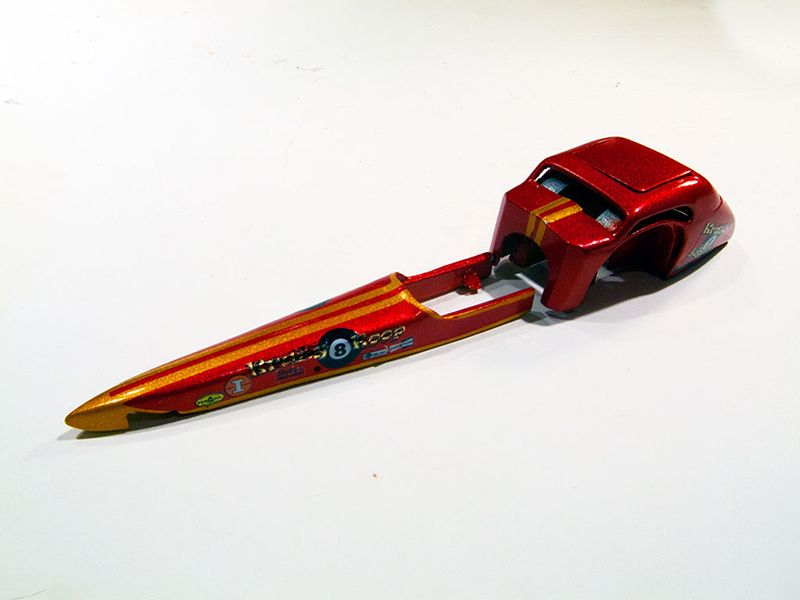 The original Fiat I did, the Terrible Toplino, had many of the features I like in a digger, but, with it's open-chassis front end, it lacks the nose piece that I want to include for a real show car paint job, perhaps in radical boat-flake. 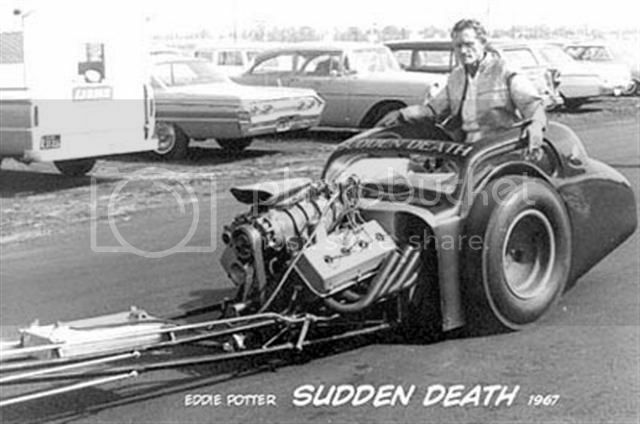 Power will be with a blown Hemi with Scott fuel injection like Sudden Death. This one is going to be awesome Bernard !! I've always loved the radical altereds . 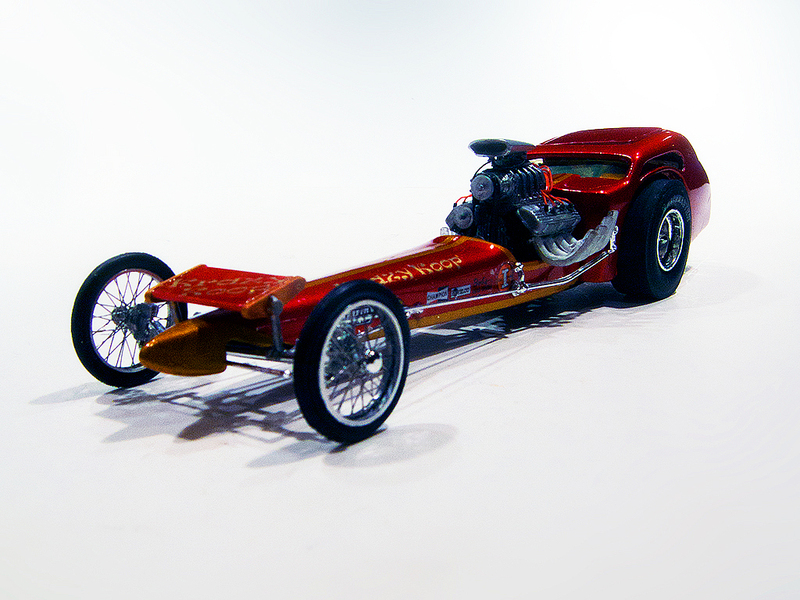 I'm 6 feet 4 , so I may have a tricky job getting in a real one though , unless its a '29 Duesenberg 4 door altered !! Oh the blasphemy ...... ! Resin bodies come in different flavors. Some are meticulously conceived transkits, designed to provide an alternate body design for an existing model kit. 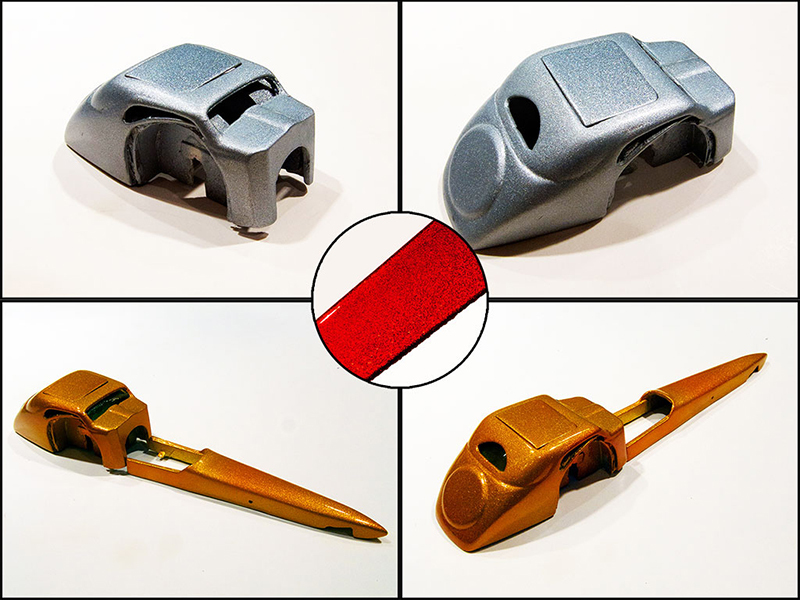 There even complete stand-alone kits, the best of which rival or even exceed the quality of the finest plastic kits. Then there are bodies which are not specifically designed to be adapted to a specific kit, and indeed may be purposely aimed at the scratch builders and kit bashers among us. This Fiat Competition coupe by Fremont Racing is from this last variety. 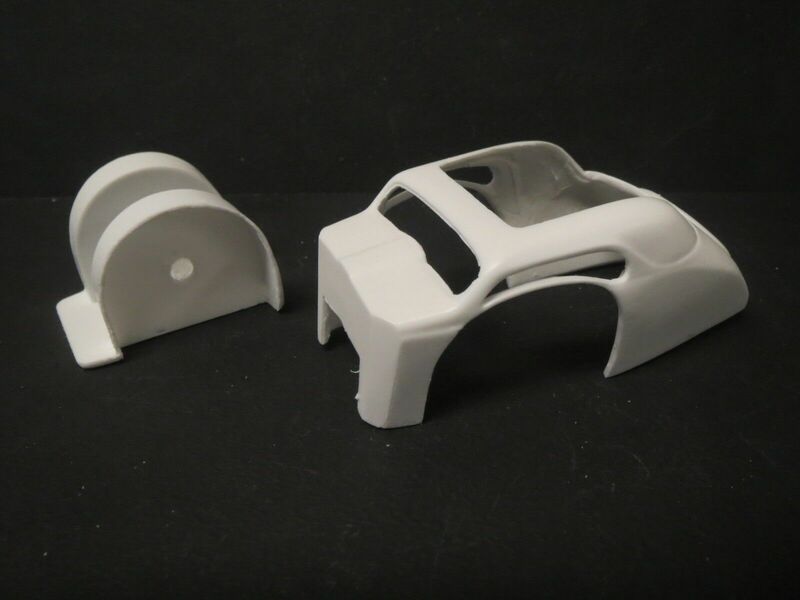 It’s very nicely cast from relatively thin and smooth white resin, but exactly which chassis it’s designed for is not indicated. It doesn’t come with instructions! And to make things more confusing, it can be had with 2 different length noses depending on which chassis you might be using. Originally I just bought the body, thinking I would adapt a nose piece from my stash. But then I saw the design of the shorter Fremont Resins nose. I liked its shape and got myself one. But before I embarked on any body adaptation work I need to figure out what chassis I would use. I asked Joe Curtis at Fremont and he told me that he had 2 chassis in mind when he did this body, and has built models with both. 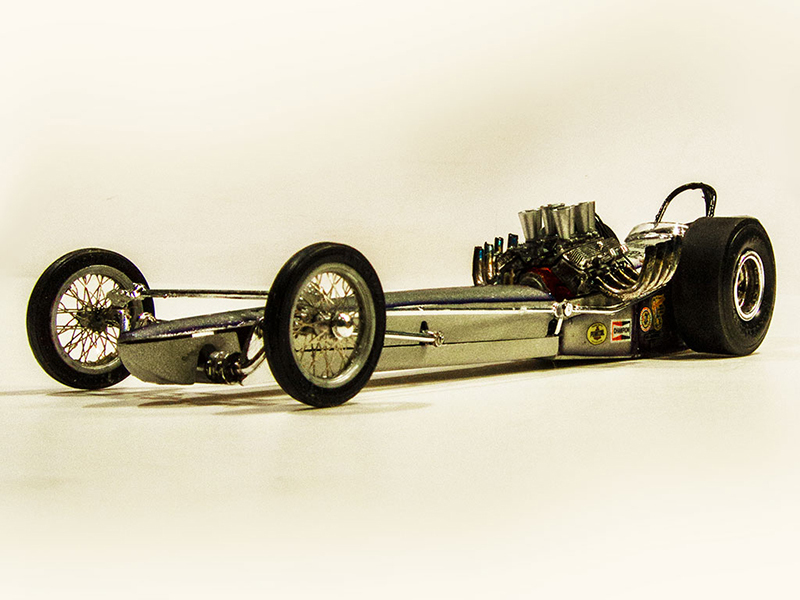 These are the long wheelbase AMT chassis that can be found in kits like the Tommy Ivo FED, Don Garlits Wynn’s Charger, and Too Much, and the shorter wheelbase MPC chassis found in the Ramchargers FED and the recently re-released Jawbreaker kit. Checking the body against both chassis I found that the distance between the firewall and the rear axle centerline on the Ramchargers chassis is an exact fit. Since this is just about my favorite kit FED chassis, with its radically low legs-under stance I went with it and ordered that slick looking short nose. But there are a few of adjustments that needed to be made. First of the one piece wheel well assembly (A in the picture below) is slightly too narrow for the chassis and I had to cut it up. 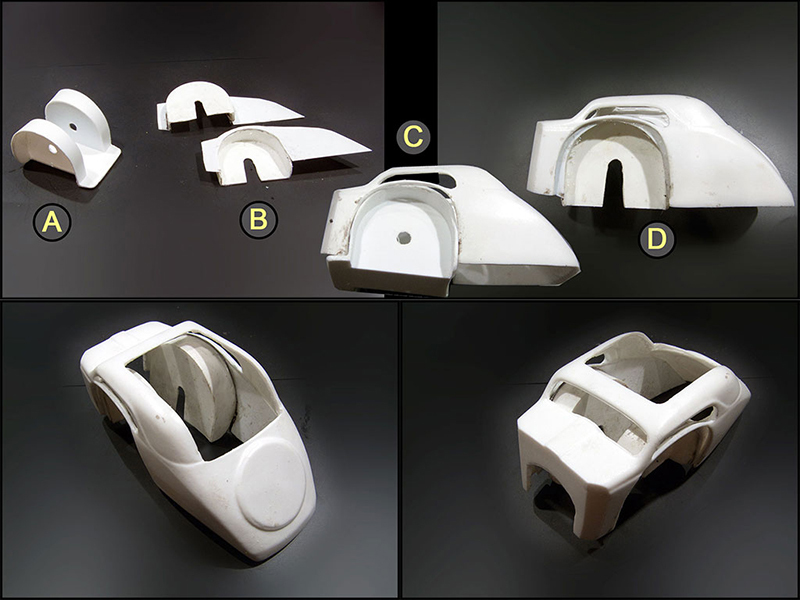 Fitting the wheel well pieces to the cutouts in the body sides revealed that they are slightly undersized and leave gaps o the sides. (See C below). I decided to align them with the tops of the arches on the bottoms of the window openings. I made panels that fit the body sides so that there would be plenty of glue area for a firm fit. (B below). The result is shown in D below. The firewall need a slight arched relief to match the Ramchargers firewall and, as the lower two images show, once the nose is fitted to the chassis and aligned with the front end it’s clear that I’ll have to extend the side panels rearward a bit. As I said, I’m using the Ramchargers chassis. 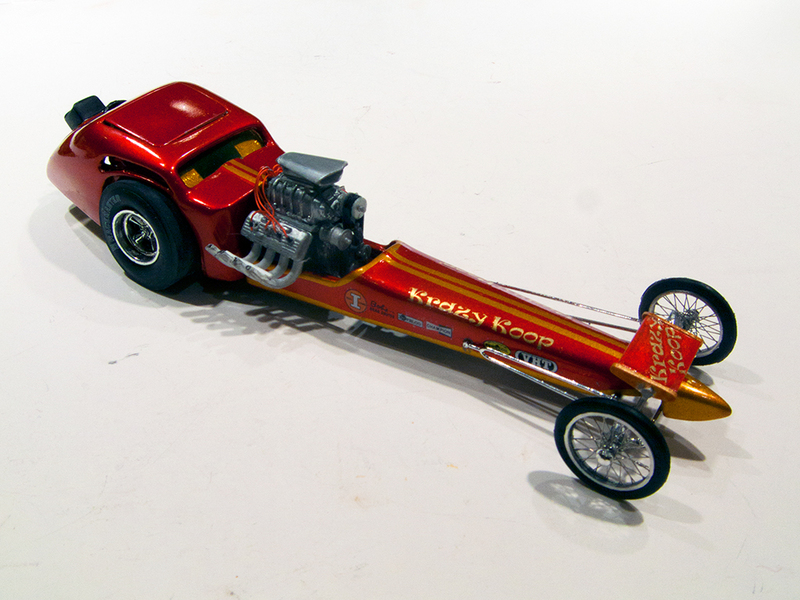 It’s largely stock except that I’ve never been fond of the somewhat narrow front axle so I adapted the pretty the pretty little tubular piece from the dragster half of the Revell Tony Nancy Double Dragster kit. I’m also using the slick looking American Racing 5 spokes mags from the Tony Nancy kit, mated to the wheel backs from the Ramchargers kit. I left the wheels plated for a polished mag look since this will be a show car, and I “chromed” the back halves with my trusty Molotow pen. The tires are from a recent AMT parts pack. The mockup below uses the Ramchargers kit front wheels and tires but I hope to be able to use true wires on the completed build. Next up is building a blown 392 Chrysler Hemi and starting on the bodywork and paint. Summer is here at last in the Pacific Northwest and my work rate at the bench is suffering, I’m afraid. Still, progress is being made on all fronts. The motor is largely done. 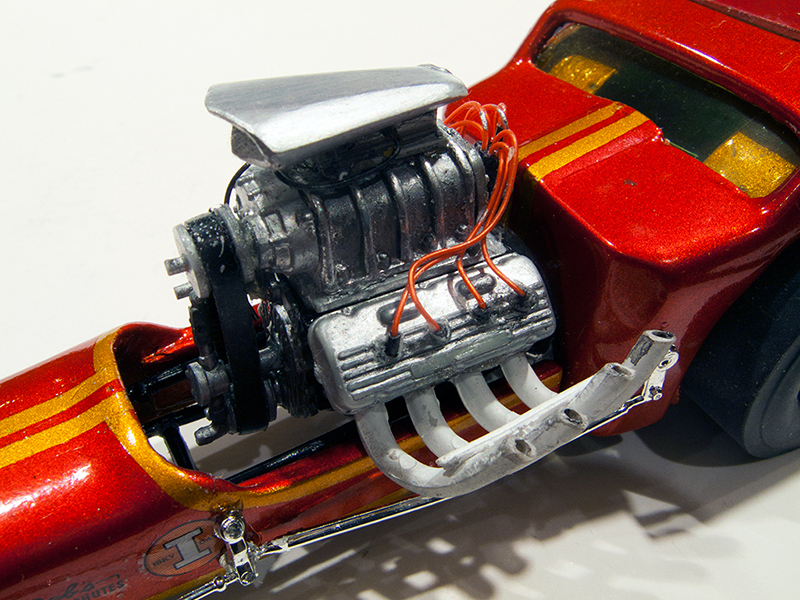 It’s a 392 Chrysler Hemi from an AMT Piranha kit with various detail parts such as the fuel pump and Cirello “Frankenstein “ magneto from an AMT Too Much kit. The headers are from the Ramchargers kit. 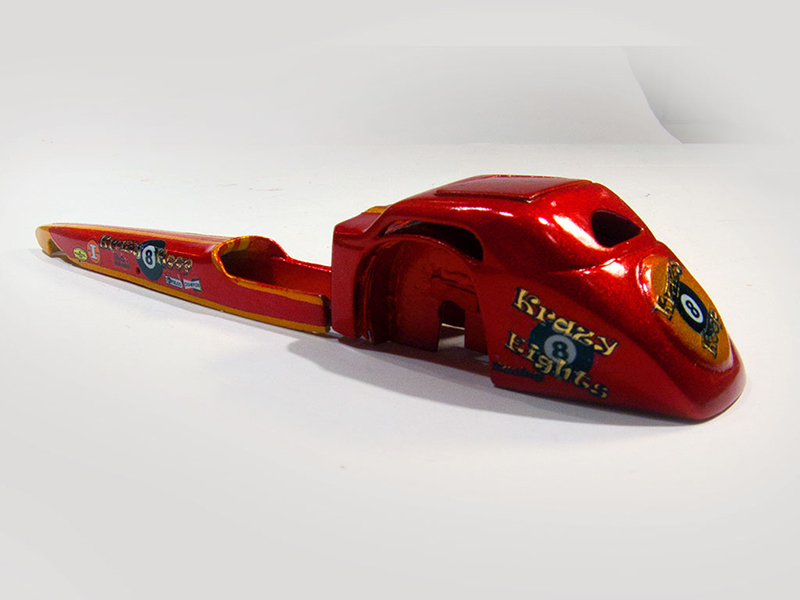 The drive pulleys are courtesy of Speed City Resin. They make a Funny Car Parts Pack that’s full of highly detailed engine goodies including these pulleys. They also make a toothed rubber Gilmer belt that will go on the motor. I was going to use their Scott Super Slot Injector as well. It’s very finely made and, like all their parts, absolutely top shelf. But I preferred the slightly different shape of a Super Slot from Altered States Models which I had used on an earlier digger build so I stole it off that motor and will use the Speed City injector as its replacement. Finish on all the parts are the usual assortment of Testors Metalizers with the ribs of the blower casing picked out in Molotow Chrome to simulate polished aluminum. I’ve started on the body work which is turning out to be quite extensive. First off I had to extend the side panels of the nose piece to meet up with the firewall. I’ll probably land up filling the seam where the additional styrene piece meets up with the resin. But the real work comes as a result of the decision to make a flip-top roof panel and fill the rear of the cab with a window panel. The whole thing is done so the back of the roll cage will just barely pop out through the window opening when the body is properly located. I made styrene panels which had to be built up to match the thickness of the resin. 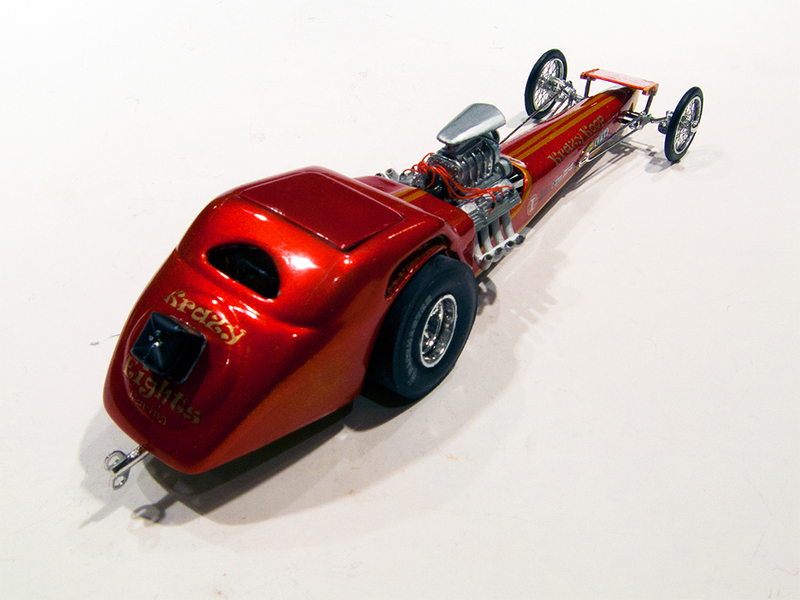 It’s based on the restored Cacklefest version of the Flamin’ Frank Pedregon Fiat which, unlike most of the original versions, has a fully covered cab. It’s very smooth and sinister looking so I took the bait and went for it. Below is a (very) rough set of workbench photos. There’s a great deal of sanding and shaping and filling to do to get the body ready for paint. Then there’s the question of a show-worthy paint and decal scheme. So this project will extend into the cooler weather of fall. The basic bodywork and base coats for the paint are completed now. 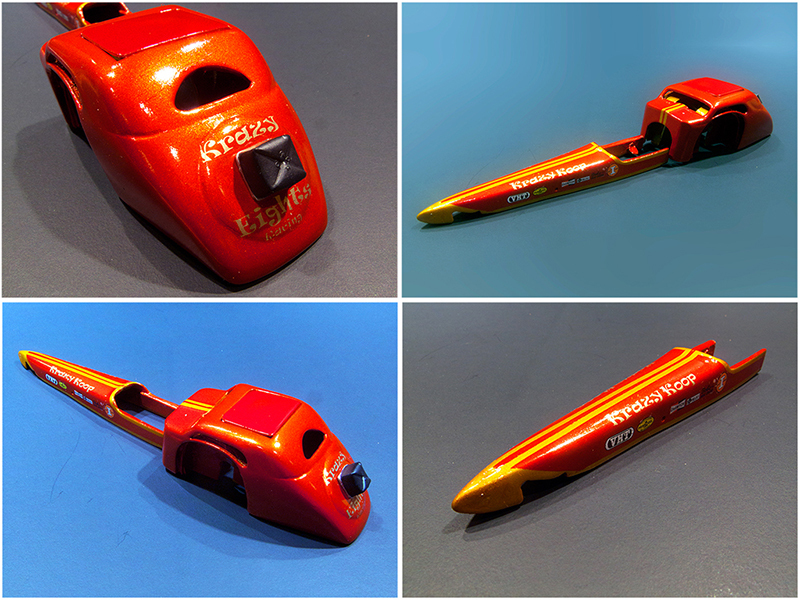 The nose piece has mounting tabs which are just visible in the pictures below. They align the rear section with the frame. The paint job consists of grey primer followed by Duplicolor MS200 Metal Specks Silver which is a coarse metalflake-like silver lacquer paint. It leaves a slightly rough texture but I didn’t want to sand out the flake so I followed up with four coats of Duplicolor Clear lacquer to smooth things out. 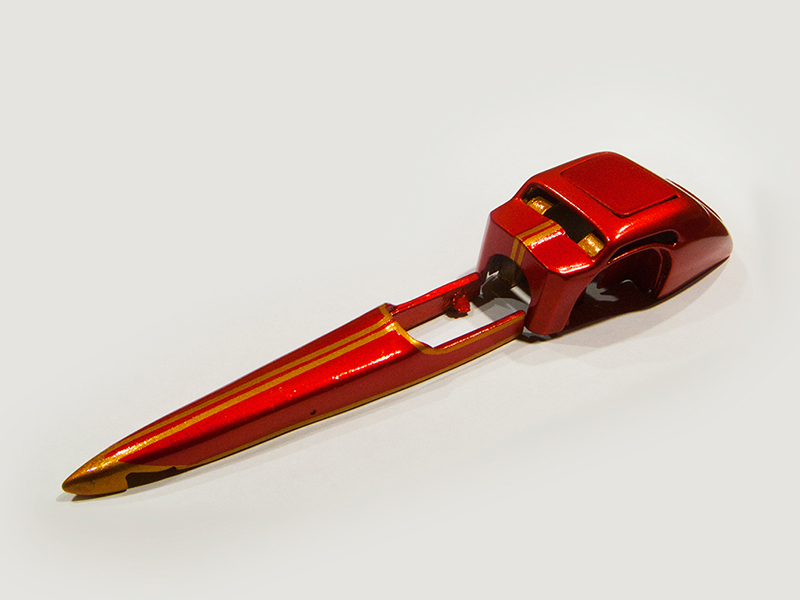 Then I shot 2 coats of Tamiya TS-73 Clear Orange which creates a deep gold undercoat. This will be followed by a masking job to create gold scallops and stripes, although at this point the final design is still up in the air. 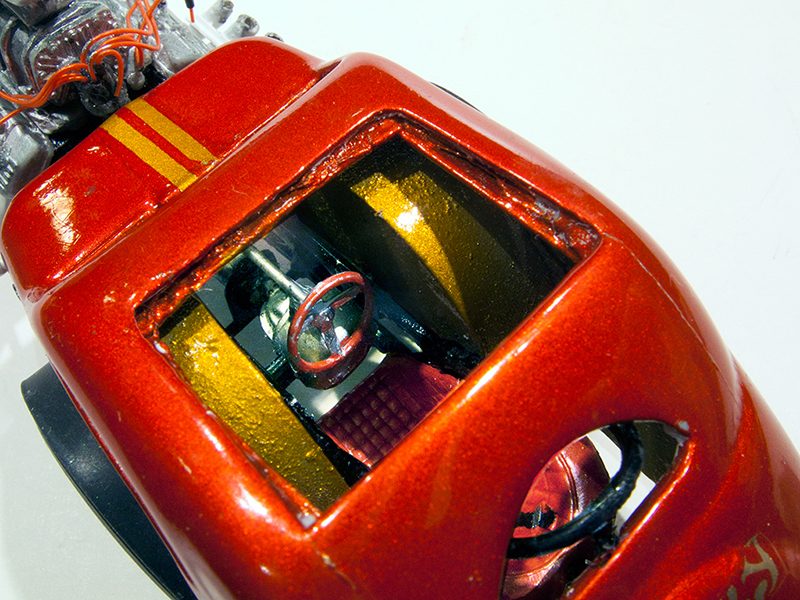 Then a final color layer of two coats of Tamiya TS-74 Clear Red to make a candy red metalflake will be applied. I’ll have some gold decals printed once I come up with a final graphics design and car name. These will go on along with various trade decals and then the whole thing will be sealed under multiple coats of clear and rubbed out. Below is a composite showing the Metal Specks Silver and gold metalflake base coats along with an inset showing what the final body color will be. The motor is completed and the chassis is waiting for the bodywork to be done before I can work on mounting brackets, the front wing, etc. I still need to do something about getting a set of true wire wheels, too. Bernard, it's guys like you (us?) that make people build box-stock! I'm loving this build! Innovation was king for the 1:1 and bleeds over into 1/25 scale for sure. This is obviously an ambitious project and the results will most certainly satisfy. Build on! The basic paint is done. Tamaya Clear Red over gold flake as explained in the last post, with the stripes, spare tire area and nose scallop picked out with masking tape. Next up, and critical to the whole effect is the graphics design which will require, among other things, naming the darn thing. But the basic paint went down with surprisingly little drama. The usual summary picture is below. Almost there! That's got to be one of my favorite color combinations and certainly fits the era. Definitely a radical body and faithfully represents some of the strange beasts that were seen on the strips of the day. Love it! Life and other modeling projects have conspired to pull me away from this project for quite some time. But the few weeks of good weather we are afforded each summer here in the Pacific Northwest have finally abated and the modeling bench beckons. This project is relatively straightforward with the notable exceptions of adding the roof and rear cab structure to the aftermarket body and developing and printing the graphics. The bodywork and paint were covered in the last update and I finally was able to get together a set of graphics for the beast. I wanted a name that would be refer somewhat to the inspiration cars, at least in spirit. These Fiat competition coupes are exaggerated, dramatic looking cars, and notorious for their dragstrip antics. Whether it’s Flamin’ Frank, Sudden Death, of the Chicken Coupe, it’s rarely business as usual for these cars. 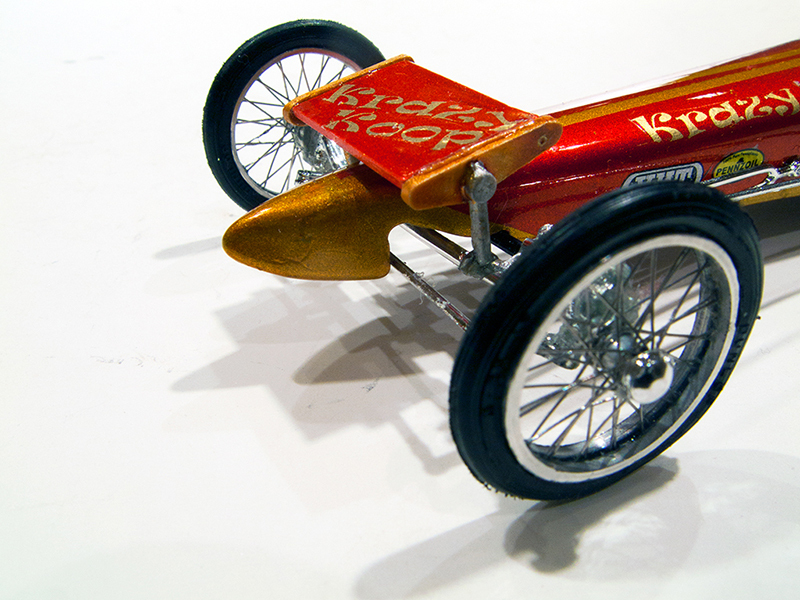 So the entrants for my version are Krazy Eights Racing and the car is the Krazy 8 Koop. The graphic is built around (behind?) the 8-Ball symbol and exaggerated 60’s style cartoon lettering (panel A below). 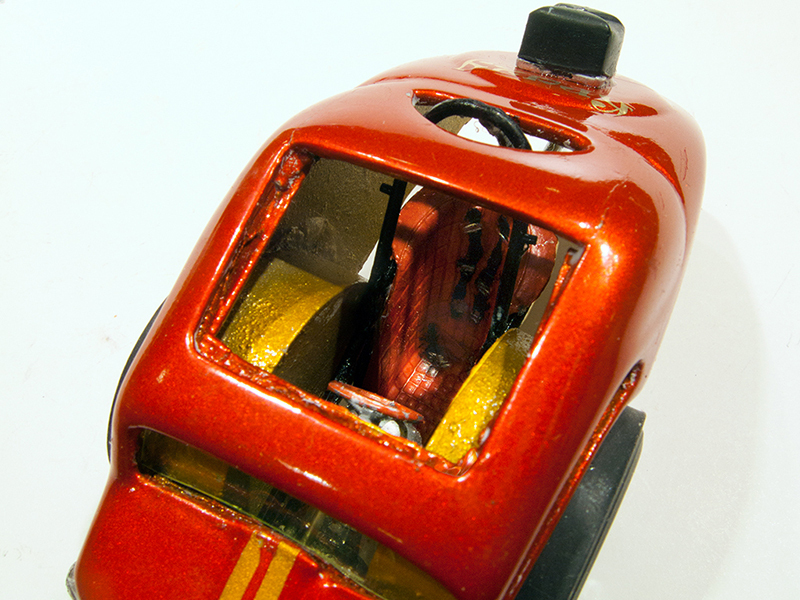 I created a faded paint transition effect from red to gold on the rear deck “tire” area using a red to clear decal. 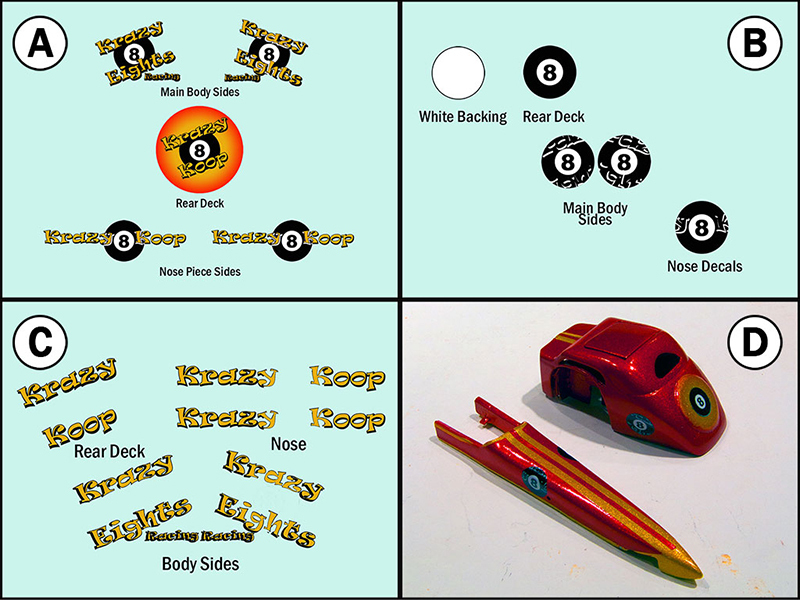 The 8-Ball for the rear deck, body sides and the nose piece are all the same size and created by laying down a white underlayment and a black and clear 8-Ball figure (panel B). The actual lettering will be gold and I will need to have it printed by a friend who has an ALPS printer that can print metallic ink to clear decal stock (panel C). Once the gold lettering is applied I’ll add additional trade decals and then clear coat the whole thing. The only other thing I’ll have to wait on before final assembly will be a set of true-wire front wheels that a friend of mine has in development. This is a project I haven’t touched for nearly 3 months, which for me is very unusual since I’m pretty much a one-project-at-a-time kind of guy and rarely jump between multiple builds. But with the TRaK 2018 Autorama contest deadline looming less than 10 days away and 3 projects penciled in for completion by then I’ve been jumping between builds like crazy. The Fiat went on hold while I had custom decals printed for it, and by the time they landed on my bench I was juggling 4 other projects and it had to wait in line. The good news is that with the decals finally applied most of what’s left is simple final assembly work and I’ve got a chance at finishing it in time. Below are pictures of the gold decals I had made as they appear on the car at last. Now they’ll get cleared and it will be time to assemble the completed car. Superb as usual Bernard, I hope your successful at the upcomming show! 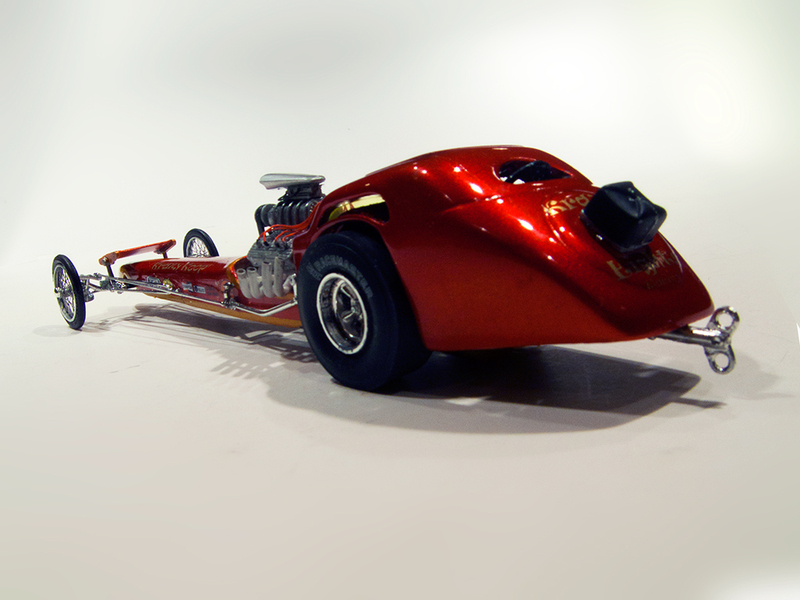 In the final week leading up to the December 31st TRaK Autorama deadline several entrants had major disasters which meant they had to drop out. I was among them, and for most of us late droputs our setbacks were paint related. In my case while applying the last of 4 layers of Duplicolor clear the paint suddenly started cracking. I have used Duopklicolor clear for many years over various brands of lacquer without any problems. Why now? I asked myself. I was surely not the only one and, indeed, misery may love company, but it was cold comfort. Fortunately there were enough of us that the judges decided to extend the deadline to January 19th. Thanks to the extension I've got a chance to include this project in the Competition category. By the time the extension was announced I had already stripped the paint. I decided the safest approach was to sand the paint down to a smooth, consistent and stable layer. This was basically the original silver metalflake layer. Then I sealed the surface with Duplicolor Primer Sealer and wet sanded that layer with 1000 grit. The result was a smooth, neutral colored (light gray) surface to start over from. This time I went for a minimum number of layers. The heavy flake of the original silver underlayer had been largely obscured by the subsequent color layers so I decided to start with a simple metallic gold base. I had some Testors Pure Gold left over from my recent customized '57 T-Bird build so I used that. I also had a little of the Tamiya Clear Orange so I shot one layer of that over the gold. The result was very close to the original gold shade the first time around. This was followed by 3 coats of Tamiya Clear Red after masking the stripe trim into place. I made one change from the first time around. The 8-ball over gold circular motif on the rear "spare tire" is now gone. After doing it I decided it was a bit busy, and then I realized I hadn't made provision for the drag chute. 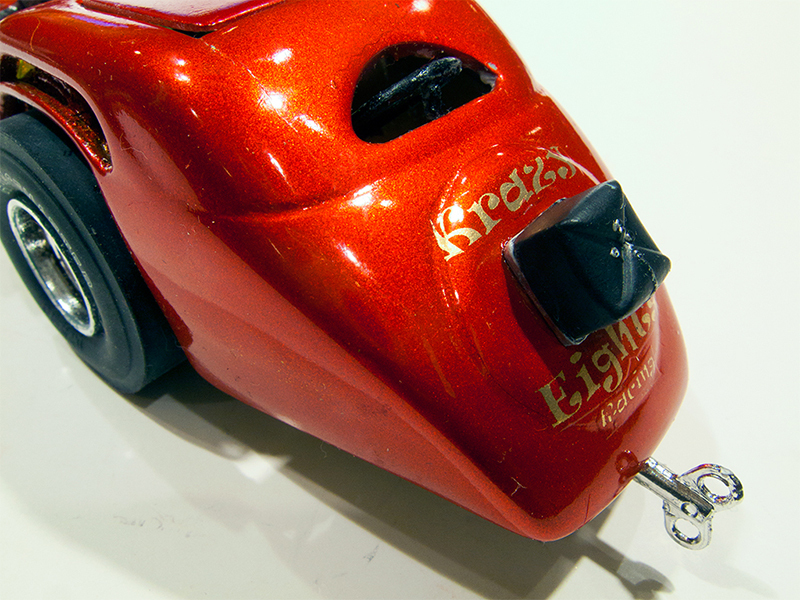 So this time around the rear deck is plain red with the drag chute to be placed in the center of the "spare tire" and the gold Krazy Koop lettering above and below it. Other than that most things should remain the same, although I'll have to use other contingency decals. One thing for sure, however, there's only about half the layers of paint compared to the first attempt. Hopefully this will avoid the prior problem. Out of the proverbial "abundance of caution" I'll be clearing with Tamiya Clear since the prior color coats are Tamiya. And hopefully I can get this done to the new deadline, now! I have had that happen, as I think all of us modellors have at one time or another, but not that late in a build. I woulda cried. I do have a technical question; what do you thin your clear orange and red paints with? I have tried to spray the Tamiya Smoke and Tamiya clear orange a couple of times now, thinning them with Tamiya thinner, only to have them go stringy, ( literally like cotton candy ) as the paint comes out of the airbrush on me. How do you do yours? Thanks Mike. So far I'm a 100% rattle can guy when it comes to body paint, so these are all spray cans so I haven't had to learn about thinning them. I have noticed tham Tamiya acrylice transparent jar paints are fairly thick even when fresh and can get thicker quite quickly if you don't make sure to screw the caps down tight. Maybe it's a different formulation than their solid colors. Well, I made it out the other side without mishaps. Phew! You'll notice that the decals scheme is very simplified. 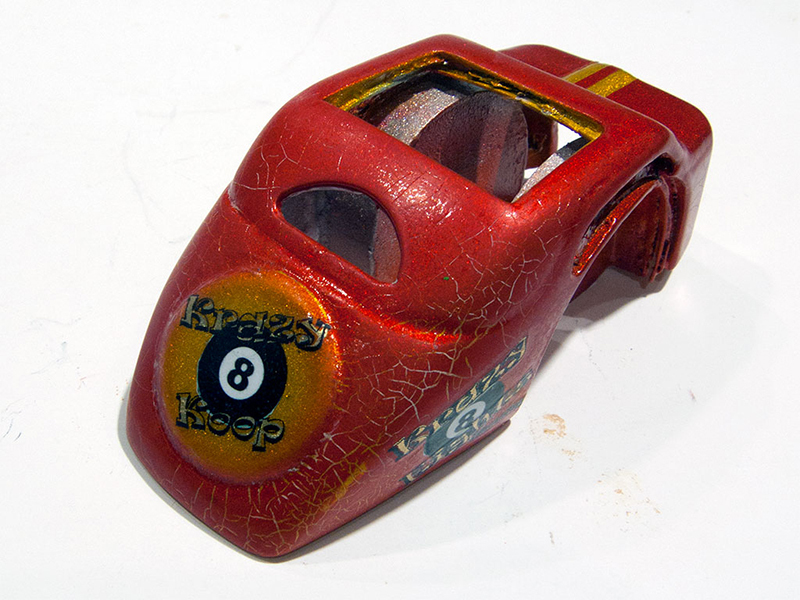 I was never quite happy with the 8-ball motif, the color and shape conflicted with the rest of the car. As date would have it, I made enough mistakes applying decals along the way that I couldn't have replicated it even if I wanted two, despite the fact that I started out with three sets. Meanwhile, I've been so focused on the darn paint job that I've almost forgotten about the mechanical bits. I've got to make sure that the final assembly process stays clean and precise... With a little over a week to go I think I have a fair chance of making it. Done! And with 5 days to spare! If the paint hadn’t blown up on me I do believe I would have gotten in under the wire on the original deadline. Thanks for the reprieve! Here are some detail pics of the final things to have been done. 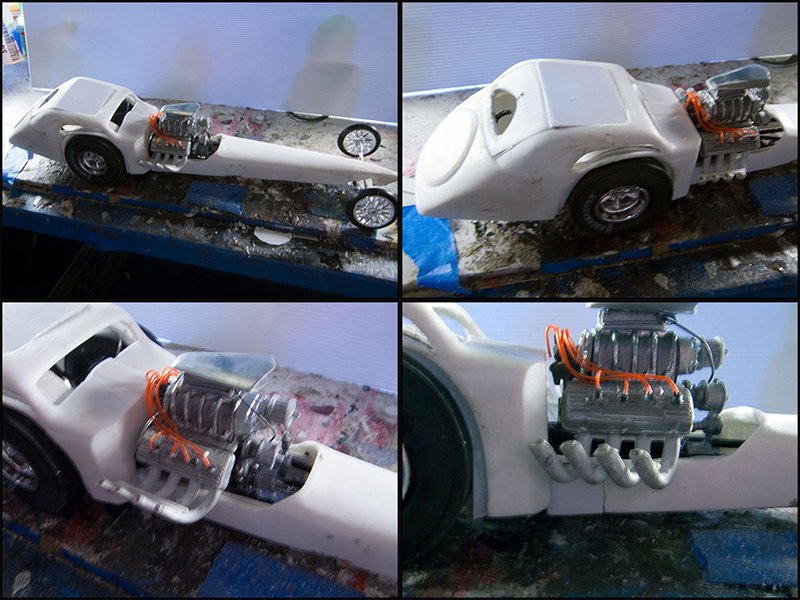 The motor was largely completed earlier b it still needed some detailing and of course fitting to the chassis. When I repainted the body I was able to pay a little closer attention to the interior surfaces and they are now painted gold to match the stripes. 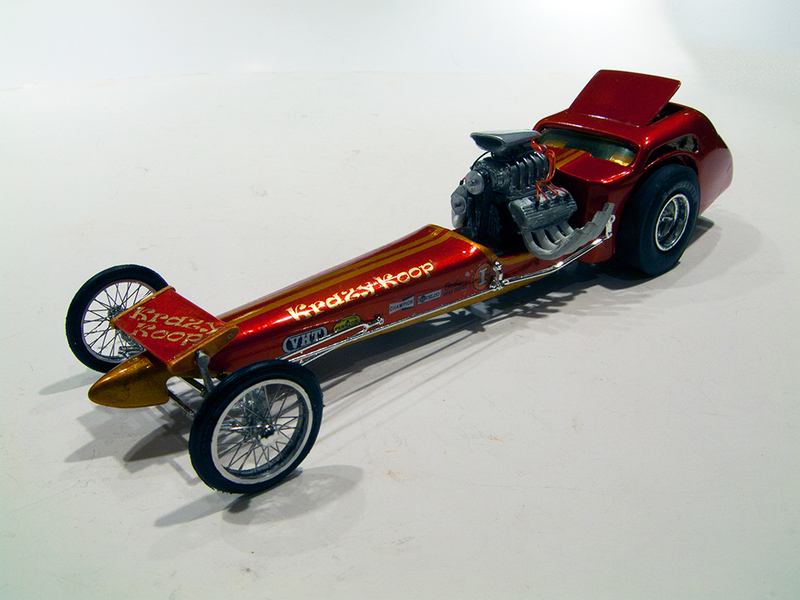 The interior furnishings are largely from the donor Ramchargers FED kit with the exception the steering wheel which is a Revell Tony Nancy Double Dragster Item. 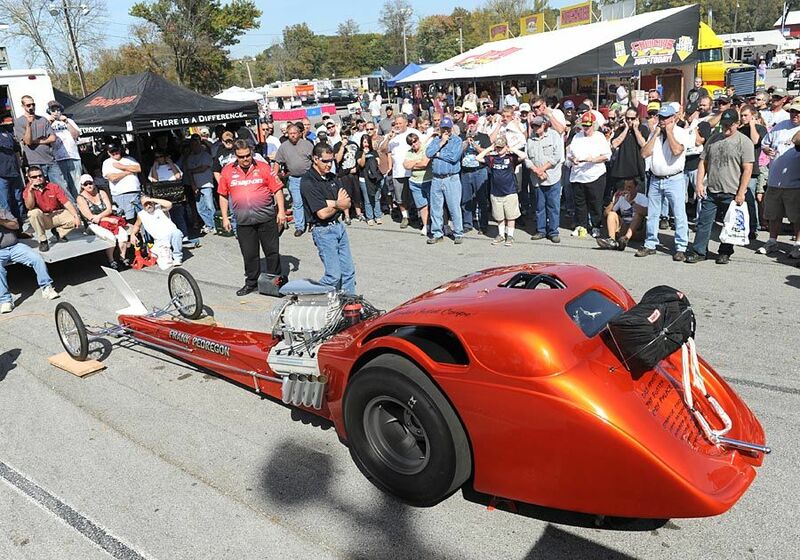 The front suspension is 100% Tony Nancy Double Dragster. The wheels are the new TruWire aftermarket items from Curt Raitz’s miniscurtraitzing.com with tires from the Tony Nancy kit. 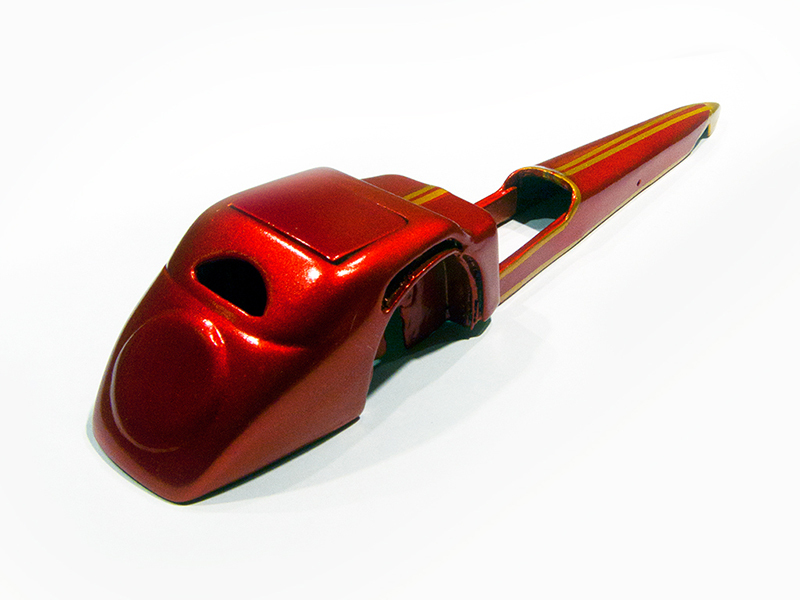 The front wing is an aftermarket resin piece from Competition Resins. 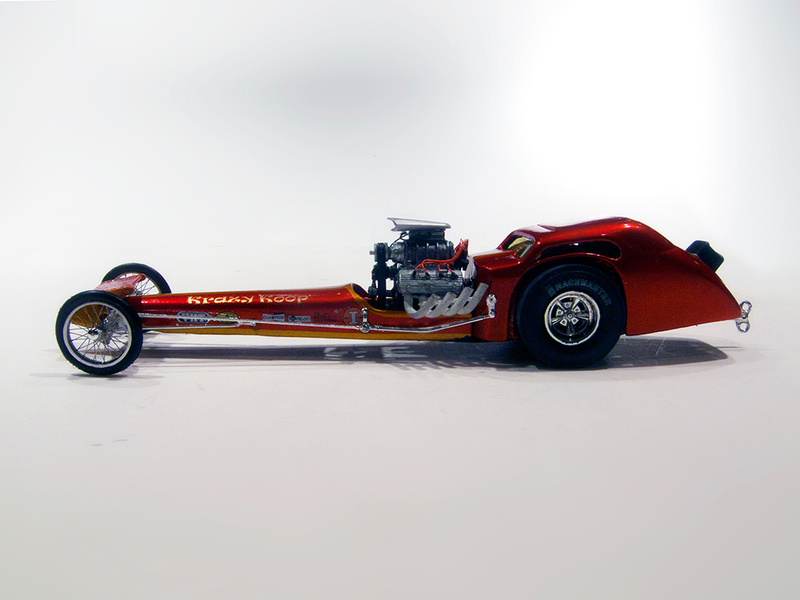 The wind-up key push-bar is from the Carl Casper Undertaker dragster kit. Thanks for following along. Formal presentation pictures will follow tomorrow! 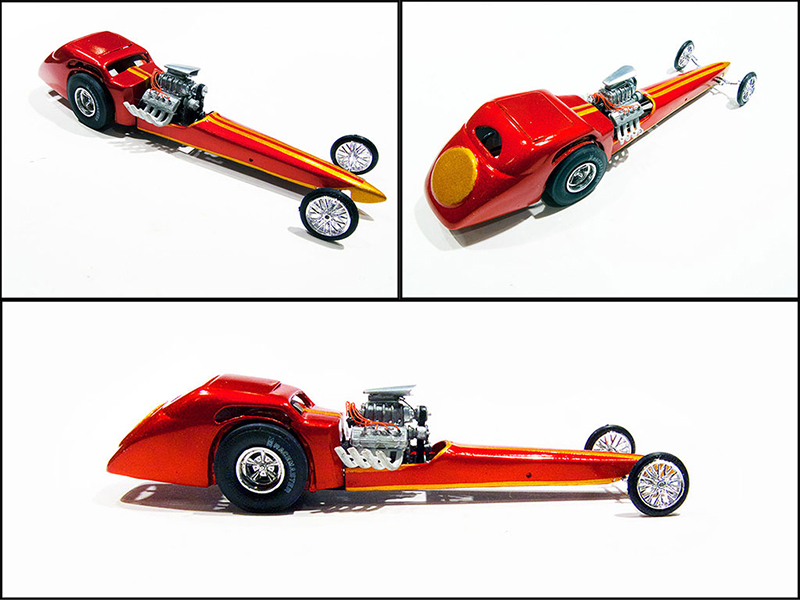 Here are the 5 finished beauty pics as entered in the TRaK Autorama plus an additional one showing the side profile. Real beautiful piece of work. Everything about it is excellent: paint, decal work, overall build integrity. I love it. Thnaks for the exceedingly kind comments. It's much appreciated.